Needless to say, some methods of generating electricity are more environmentally friendly than others. For example, coal fired generation plants are regarded as having the largest CO2 footprint followed by diesel and fuel oil plants. Natural gas fuelled plants are better for the environment but still involve the burning of fossil fuels and the release of carbon dioxide. At the other end of the spectrum is nuclear energy which is considered to be the cleanest form of energy, although it does suffer from the issue of dealing with nuclear waste. Other forms of clean energy include hydro-electric power, wind and solar power. 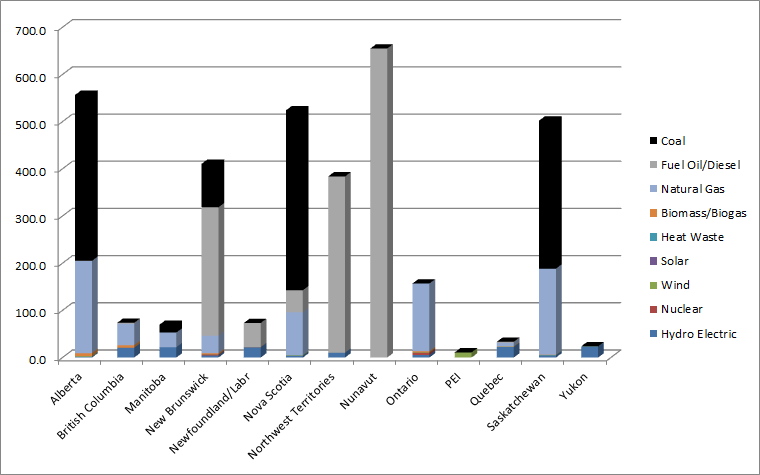 In the chart below we have given each province and territory a CO2 score based on the percentage of their electricity that comes from "dirty" sources. Obviously this chart does not reflect the absolute carbon emissions, for example, Nunavut has a very high score because all of its electricity is generated by burning fossil fuels but because it only generates about 1/2,400th of all the electricity produced in Canada, the total carbon output is not very high.